The 101st issue of the Darklands Gazette!!!! Ultra Fusionfall Forum > Forum > General Boards > General Discussion > The 101st issue of the Darklands Gazette!!!! The Darklands Gazette. The Darklands just got a lot darker, and is becoming bigger. The purpose of this issue is to pay tribute to FusionFall. Because of this, the first half is dedicated to earlier articles of the Gazette. Hey Fusion Fallers ready for the “What’s new in Fusion Fall article?” This week thousands of Future players busted into the Past after Fusion Fall said, “We are 100% Free!” Which made Fusion Fallers go crazy! But with this good news went a price. The forums were closed due to some things the FF team could not reveal to the public. So I went to find out myself and what you will be reading will shock you. When I sent an email to the GM’s they replied back and this is what they said, “We are sorry that we had to close down the forums but it was because had to discuss many things with the CN writers. They said that we would have to give up something for the Generator Rex update and the Alien Abduction Event. We hope to open somewhere around the summer.” Yes, this was what was written back and we may be able to get the forums back in the summer! I will keep you updated on this. 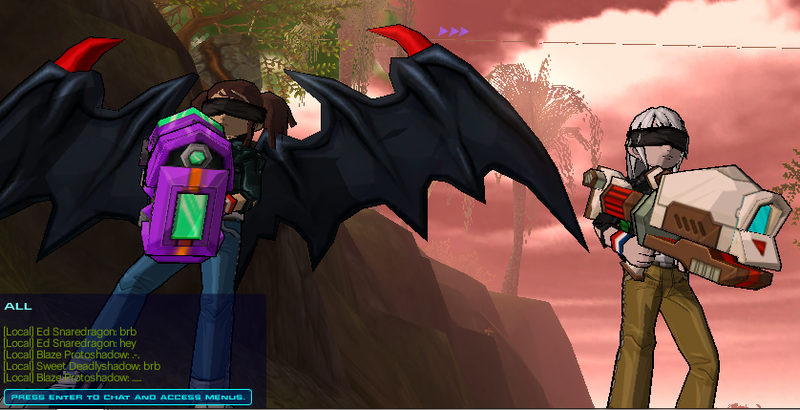 In other news, the Generator Rex hover board is making it really easy to speed around the world of Fusion Fall. And many are happy about the fact that it has a speed of 1100! Which is faster out there than our other hover boards around Fusion Fall and may be in for a great summer which hits in four weeks! Thanks for reading! Possibly the biggest change to Fusion Fall ever is the F2P patch or Free to Play. This patch (if you don’t know) is the patch that announced Fusion Fall completely free. Some say that this is a great leap for Fusion Fall, but is it really? With the F2P patch the forums went down and so did the clubs and friendships, also the lag has increased 10 fold. People aren’t as upset about the lag they are more upset about the loss of the forums saying things like, “This is the only reason I played the game” but others seem to not care saying, “Free is better than forums.” While some are very biased opinions others are asking why. There has been some speculation that the GM’s were laid off. But that is just a myth there is most likely a cost attributed to the forums that people do not realize and they had to cut somewhere to make Fusion Fall free. A great leap… or not is the title of the article because even though we have gone from a new era of Fusion Fall, how many Viva Alecto’s have we stopped from coming out, how many Jrs. Oldman’s are left out of helping people. What if there are people out there that would have run great trading empires or maybe there were clubs yet to come. So is this a great leap…or not? Advertising is a bad thing for a FUFA... but this one left with approval. This week's Item Spotlight are the Courage and Katz Tees! A treat for Courage fans like myself indeed. The Eustace Mask was getting a little lonely. Whether you prefer the "brave" Courage or the sadistic and evil Katz, you show your spirit for the show! If you deleted your shirts while they were still in C&Ds form, do not worry, the shirts are tradeable! So go wear your cartoony dog shirt today! The Darklands Gazette was founded by William Silverblade and had posted the first issue on October 18th 2009. Later when William decided to quit Fusion Fall, he left the Darklands Gazette to Western Riley Gizmo, the first person to sign up to join the Darklands Gazette. But after a while when Western would only come on once in a while, the Gazette fell into my hands. It was tough trying to make the Gazette bigger since we had two large competitors, owned by Flip and Xavier. After getting an offer from Flip to sell the Gazette and rejecting it, I worked harder to make the Gazette more known. It’s been very hard but thanks to so many friends helping along the way with their great articles, the Darklands Gazette has become what it is today. I want to thank all of the site owners where I post the Gazette for helping keep Gazette alive after the Official Fusion Fall forums were removed, I want to thank all of the Gazette fans out there for supporting us and giving out their opinions and suggestions for the Gazette, but most of all I want to thank all of the Gazette members for turning in great articles and helping shape the Gazette. The Gazette couldn’t have been possible without everyone being there every step of the way. In City Station, nothing is normal. Many things there are so advanced that they make Japan look like a village.On the rooftops you'll find find cabinets, and lots of GOO!!! The middle area in Tech Square is a nice place to hang out with many resources and flying monkeys. Race, pick on Mandark, beat up Mandark, make Mandark cry, there are so many things to do! Inhabited by Fusion brutes, crabs and shrimp, Dexter's old ship continues to provide amusement for us. It is also a sign of relief for those who have trouble with platforming. It's out of the map and not fixed. An inhabitable island right there for us Fusionfallers! Don't say a word about it to the GMs, because who would want that thing covered by an invisible wall? This thing is a challenge! great place to play hide and seek, race, and have a party! Climbing is quite the task too! Like a very "private" Blackhead, some people come here to trade as an alternative to Blackhead. Home to shops and a HALFPIPE! Mythology is upon us! This serpent provides passage for players who wish to get to the Darklands. That means the Darklands are not up in the air! Once home to the Mother Blowfish, this underrated place serves as a nice getaway spot, maybe with that special someone or maybe with those special sets, either way, you'll enjoy staying here. The most beautiful place in FUFA home to the Te Xuan Ze Statue! Jumping off the waterfall is fun too! Fusion Mac doesn't like visitors but then again he's not much of a threat. 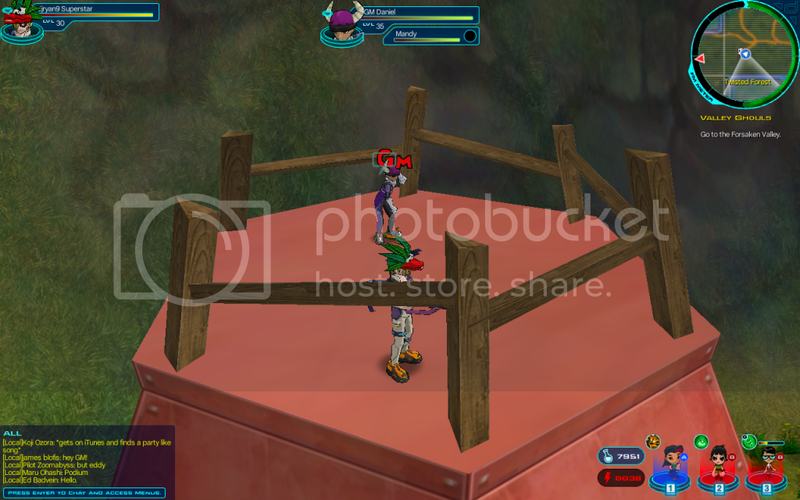 #1, the coolest place in Fusionfall: The Giant Tree in Acorn Flats! Tall, and very lonely. This tree used to be a regular unreachable tree until Mushrooms were added. That update made this spot the Coolest Place in FusionFall! Contributed by CourageThaarSharpshoot, TurqoiseAngel, dex7322, and Titan. To celebrate the Darklands Gazette, in honor of Zoey Sparklebird, the one who has been keeping the Gazette alive, this week's item spotlight is the superfluously popular; but not overrated, BUBBLES DYNAMO SET! 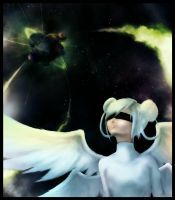 To go with Zoey's somewhat iconic Bubbles forum icon, this set is won at IZs of it's level via races. The Ruins is the best place for new racers to start and try to get their set! Makes a great anime robot fighter set too! I hope you have enjoyed the gazette so far and the gazette will continue to amuse you! This has been this week's item spotlight! Man, I've been waiting for this review! My all time favorite game Sonic Adventure for Gamecube/Dreamcast. Sonic Adventure takes place in a possibly modern day time. You can play as Sonic, Tails, Knuckles, Amy, Big the Cat, and E-102 Gamma. Each character has a special story but, not always the same level. The plot of the game is Trying Dr. Eggman from taking over the world with his newest creature, Chaos. You must defeat both to beat the game. So the game has brilliant sound, kind of good graphics depending on the system. Overall a 10. As a 50th issue special, we crowned NPCs titles that we tough fit them best! 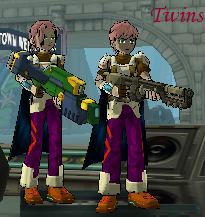 Best Birthday Bash NPC: T.O.M. Contributed by CourageThaarSharpshoot, TurqoiseAngel, and Titan. Your positivity this week is important. You're probably working hard and grinding for an item you really want, trying to reach a goal or hoping to be a top scorer in a race...and that's great- but be aware that this week is not without its challenges and pitfalls. Keep your horns held high and headbutt any Fusion that gets in the way of your goal. Your natural gift of patience will pay off this week- you will finally accomplish a goal you have been working very hard to achieve. Be warned...the temptation to be greedy will make the sweet taste of victory go sour and you will suffer unpleasant consequences. This recent update will make your natural adaptablility flourish! You will enjoy the new update and challenges that come with the brand new tutorial much more than others as it feeds your natural problem-solving creativity. Be careful- your curiosity may justkill you...or get you stuck in a place you can't warp away from. Your shrewd and careful nature will prove smart in Fusion Fall this week. You're not dumb enough to fall for Fuse's tricks and will easily make your way out of difficult situations. But be careful...you may overspend your taro and you'll be forced to sell a rare item you do not want to let go...let it go. This experience will help you overcome your inability to uncling yourself from the superficial. Your generosity will get the best of you this week. Don't be surprised if someone rips you off with taro or an item...or that you offer to help someone in game and they abandon you somewhere. Be very cautious with your bank this week. Normally your perfectionism would be a flaw, but this week it will prove in your favor in game. It may be an outfit you're trying to put together or the perfect name for your new character...but your patience and perfectionism will be rewarded with praise! Feeling romantic this week, aren't you? Since you're in a funny, loving mood, (just perfect for February! 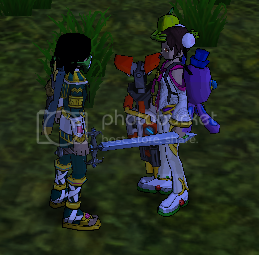 ), get in game and get some funny screenshots of you flirting with the npcs! But beware, perhaps while on your fun trip to harass Dexter or Eddy with blowing kisses...someone nearby will try to scam you out of something you own. Don't trade with anyone you don't know and trust this week. Your jealousy may strain relationships with friends this week. Try and get over your infatuation with a certain item or race rank and be happy for your friend's success! Your determination will also pay off...don't give up. No amount of browser crashes will rash down on your goals. This new update will give you time to stretch your wings and feel freer and invigorated as you first log in. However, you may feel let down from the recent hype but don't let that discourage you. Search hard enough and perhaps you'll find a very fun mission you may have overlooked earlier. Your pessimism will be your undoing this week. Try and overcome it by logging in game...the new update will actually be quite fun for you. Your humor will also grant you new friends and great trades this week. Your friendliness will prove quite useful this week- you'll find the help you are looking for and perhaps you will make a new life-long friend....IF you can get over your unecessary distrust. Your compassion will be your undoing this week. You are likely to find yourself frazzled trying to help too many newbies at once. Try only helping one person a day and keep your chin up if you are abandoned by them somewhere. Even though your urge to play the game is rising (and your urge to help others) - try and remember what is important. Finish your chores, homework or any other more important work you have to do before you get in game. The FF team has made some accidental leaks in the past, such as that Scooby Doo holosuit that never really saw a purpose. However, the coolest leak was a weapon like no other, a huge yellow hand. That's right folks, I'm talking about the hand of Van Kleiss himself. The devs managed to track Van Kleiss down, torture him, amputate his hand, somehow mass produce, and gave to random monsters in the sewers JUST for us. We love you GMs! This has been this week's ITEM SPOTLIGHT. This week for my band spotlight section, I am going to spotlight Rob Zombie. He has many songs and in my opinion are all good, but I cannot say for anyone else. My favorite would have to be Dragula (look up the song but do not post it in chat, the Gazette,it’s writers, and owner can’t be held accountable if you do that).Rob not only does music but he also does movies like Halloween/Halloween 2,he has also been on many shows like Criss angel Mindfreak (buried alive), and that has been this week’s band spotlight. Girls just want to have fun, by Cyndi Lauper. It was number two on the Billboard Hot 100 for two weeks, and is considered one of the most defining songs of the 80s. She'd say that things were good. Well, you're listening to me. And you might just jump back. Please come take me away, Haha. But Dad shoots woodpeckers off the house. Who works at the Funny Farm. Please come take me away, hehe. It was a windy night with many clouds in the sky. But even with all of them Planet Fusion was still visible in the sky. Razor Fang, leader of The Fusion Fighters, was sitting with his back up against a tree in the Twisted Forest waiting for his deputy to bring the scamper to pick him up. There was a sound in the bracken on the other side of the field. A Creeper King jumped out and came running at him. I gave a faint smile. "Hey its about time you decided to attack" a piercing sound echoed through the trees as I pulled out my sword and cut the creature in half when it got close enough. "Well that was a nice kill" came a voice in the darkness. I knew who it was so I didn't need to turn toward it. I whiped the goo off my blade and say" Its about time you got here Blake I've been waiting for hours." Blake Bronzewise stepped out from behind a tree and walked toward me "Sorry" he says, "I had a little mishap at Mount Blackhead. But anyway why did I have to come get you? Why didn't you just take the Monkey Lines?" I turn toward him and stand up " Because the Granite Grabbers where guarding it and I was already injured from my fight with the Freakish Frogs." I said indicating the wound on my hip. "Well lets get going then" Blake says impatiently. "Alright, alright let’s get going then. So where is the Scamper?" I look around. "This way" Blake says indicating a path through the trees. The Scamper zooms through the night air on our way back to Mount Blackhead. "Hey, Blake, what sorta mishap did you have at Mount Blackhead that made you late?" Blake's face turns solom and he says " The Society of Light ambushed us when we were about to come get you. I think the fight is still going on for that matter." "Are you kidding me!" I exclaim. "You should have told me. We need to get back as fast as we can! "I flinch at the wound on my hip hurting. Blake says "No we need to get you to med-lab. Pilot get us to Mount Blackhead med-lab as fast as possible." I try to object to this telling Blake I can fight. But he wouldn't hear any of it. "Blake I'm ordering you to stand aside. I want to help my team." "Fine" Blake gives in "But if you get hurt worse, then don't come crying to me." I then tell the pilot "Don't dock at the scamper loading area they'll expect us to be there. Land next to the Infected training area and we can go through the back." The Pilot says "Yes sir, but that'll cost you extra." The Infected zone was getting close I could see it out the window. The scamper landed with a soft thump on the grassy forest floor. Me and Blake hop out and the Pilot turns the engine off. "Blake where is Major?" I ask. "I left him in charge of the team while I came and got you. He has probably already beat the S.O.L." he says hopefully. I pulled my nanocom out of my pocket and turned it on "Major Zeroice do you read me?" I say into it. A voice comes out "Yo, Razor nice to hear your voice man. You missed it! The S.O.L. ambushed us!--" I cut him off "I know Major, Blake has filled me in, where are they now?" Major continues "We have pushed them back to the outer wall. I think they're trying to retreat into the forest. What do you want us to do?" I answer him back "Let them come to the forest. Me and Blake will be waiting for them. After you let them leave wait a few minutes then bring everyone with you and help us out. We can keep them here until you guys come." There is a pause then Major says "Razor I'm not sure if that’s a good idea. A lot of our team is injured and need treatment. Snake Metallusclaw shot Nero in the back and Astro got hit by a rocket. Special Crimsonscout, Little Hallenraven, and Zany Von Hawk are the only ones that weren't injured including me." I think for a moment. "Major you and Special come. Have Hallen and Zany take the injured to med-lab. Over and out." I turn my nanocom to map settting. "Alright Blake" I turn toward him and indicate to my nanocom " the S.O.L. will be coming this way so we'll hide on top of the tree arch near the Twisted River and drop down on them when the least suspect it. We'll keep them from running off until Major and Special arive." Blake pulls out his nanocom and summons his Mac nano. It come out and says "MAC!" Then blake says " alright let’s get going." I bring out my Dexter nano and we both rocket boost up to the tree arch. "Thanks Dexter" I say as I return him to the nanocom and he says "Bye bye". Blake also returned his nano and got his gun ready. I pull out my sword and we both sit there and wait for the S.O.L. Snake Metallusclaw the Leader of the S.O.L came running with his team behind him. He stops right below the arch and says "Ha those Fusion Fighters didn't know what hit them!" he laughs evilly. "Yeah and without their leader and deputy there, they were helpless" says The Warrior. Blake then pulls out a grenade and drops it on the group of S.O.L members. They all get flung backwards and me and Blake then jump down and start attacking them. Snake yells "S.O.L. attack!" Me and Blake stand back to back and summon our Humongosaur nanos and have them use ground quake to knock them off their feet and blast them. Snake uses his Numbuh 1 nano to shoot at me and I cut the bullet with my sword. Blake then shoots Snake in the leg with his gun and Snake falls with a thump and starts flailing. I say aloud "You have all paid the price for your dishonorable acts. Attacking a group without warning and attacking them with their backs turned. Take your injured and leave. I pick up Snake's gun and I throw it against a rock and brake it "that’s for Nero." The uninjured S.O.L pick up their comrades and run away with them. Major and Special then run up to me and say "Hey you already took care of them! Man I wanted to help." Special slaps Major in the head and says "Hey can't you see Razor is injured? Stop complaining and let’s get him to med-lab." Major would normally say "hey I'm the general you can't do that to me" but he kept his mouth shut. I say "It’s alright special it’s just a Freakish Frog wound. But I want guards posted around the med-lab in case the S.O.L try to attack our injured. Also did anyone else not in our team get caught in the cross fire?" "Yes" says Major, " several KND operatives got injured which is what I was about to mention. The Mount Blackhead med-lab is full our troops can't be treated there. We'll have to go somewhere else." I started to think. Where could we go? Wait! Of course I knew where we could go "Let’s go to our HQ and use our med-lab." "But it’s too far away we may not get there in time " says Special "Why not go to Camp Kidney?" I thought about this "Special you’re right let’s get them to Camp Kidney as soon as possible. Earlier this week, I had gone in game to check out what has the entire Cartoon Network Universe babbling about, and boy was it well worth the time! After two years, Dracula has decided to visit the Peach Creek Commons cul-de-sac to spice up heroes' Halloween celebrations. However, Dracula's a little bit picky about what he has to sell the players. His inventory includes Pumpkin C.R.A.T.E.s from last year, new ones for this year, and some special Ben 10-inspired sets that help players transition into the Halloween affect. These special items can cost as much as 50,000 Taros! Of course, the players are looking to host their own player-run events throughout October as well. Are YOU one of those people? Check out the first link at the end of this article to register your player-run event today! Visitors may also visit that link to make plans for which ones they may want to attend! Sources also tell that the Cartoon Network Universe's leading team members are going to be planning some things for us all as well! That's all I've got for you this week, everybody! See you next time, and I hope you enjoy the rest of today's edition of the Darklands Gazette! 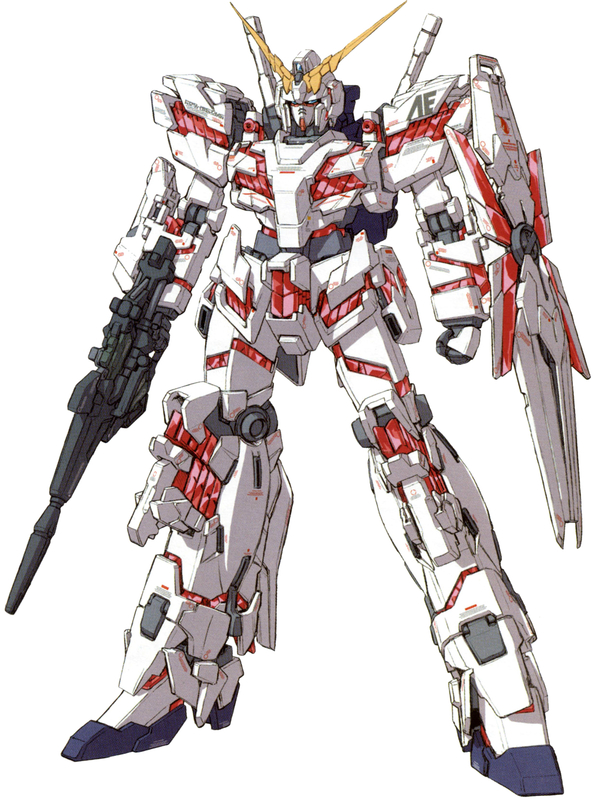 RX-0 Unicorn Gundam (aka Unicorn Gundam, Unicorn, RX-0) is the titular mobile suit of Mobile Suit Gundam Unicorn, piloted by Banagher Links. When used for noble reasons by a pilot possessing the proper character, the RX-0 is the "key" to opening a mysterious object known only as "Laplace's Box". Incorporating test data obtained from the experimental MSN-06S Sinanju, the entire frame is lined with psyco-frame receptors, drastically increasing the responsiveness of the unit and allowing it to be piloted like an extension of the pilot's body. In some cases, this responsiveness is so high that it appears the suit acts of its own accord without the pilot making any conscious actions. It utilizes a special "La+ Program" OS and a system known as the "NT-D (Newtype-Destroyer)", which activates the suit's psyco-frame and dramatically increases the suits performance. 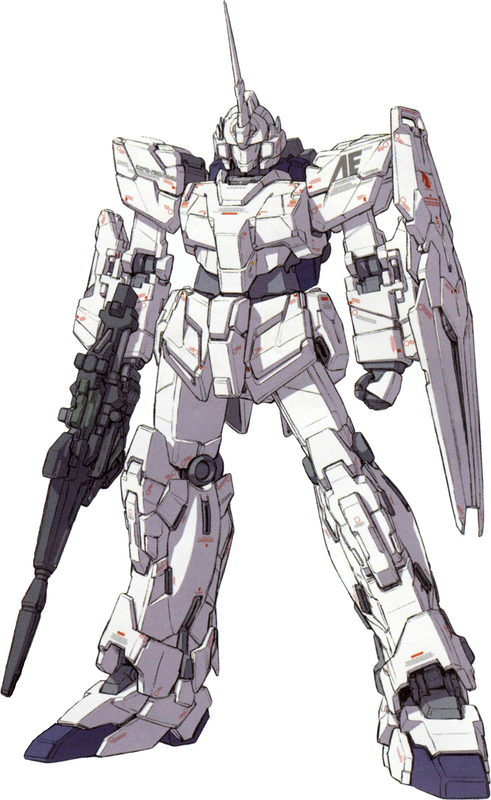 In its normal mode, the Unicorn's head is similar in appearance to those of Londo Bell's mass-produced mobile suits, with the addition of a single, horn-like antenna extending from the forehead (hence the name "Unicorn"). In terms of its armaments in normal mode, the Unicorn is very lightly armed, with half of its built-in weaponry only being available in Destroy Mode. Destroy Mode is the form the Unicorn Gundam takes when its NT-D System is activated. The transformation is marked by an expansion of the suit's frame. The armor seams separate and lock down into various hard-points, while the newly exposed psyco-frame emits a deep red glow (attributed to a psyco-frame luminescence phenomenon). In this mode, the mobile suit becomes taller and its head transforms to one having standard Gundam features, the visor and face guard transforming to reveal the mouth plate and the antenna splitting into a V-fin. In order to prevent its transformation being interrupted, its I-Field strength will be increased, at least temporary. Additionally a pair of beam Vulcan guns will be revealed on the shoulders, and two additional beam sabers will extend out of the backpack.In this form, the suit's psyco-frame scans the pilot's thoughts and directly transmits them to the suit's drive system; in other words, the Unicorn can ultimately be controlled by the pilot's thoughts alone. The machine's performance - its mobility in particular - is dramatically increased when the NT-D is active partially due to the exposure and activation of six additional thrusters. In addition to the performance boost, the NT-D also allows the Unicorn to take control of an enemy's psycommu weapons. However, the stress placed on the mind by manipulating an object more than tenfold the size of an average human is extraordinary. Even with the aid of the psyco-frame the pilot's mind can only endure roughly five minutes of operation before a safeguard is believed to activate, deactivating the psyco-frame and returning the mobile suit to its normal form. Furthermore, the system activates not according to the pilot's discretion, but automatically upon the detection of another Newtype. The system also directs the movement of the suit when active, and does not completely depend on the pilot for commands. By default, the system will automatically attempt to destroy any Newtype enemies it detects, but requires the pilot to give it a conscience so it does not merely become a killing machine. A manipulator-operated, Gatling-style beam weapon capable of high-rate firing. This fully automatic weapon was equipped by the Sleeves to the Unicorn when the machine escaped from Palau. Though initially incompatible when given enough time the Unicorn's OS can adapt to and recognize the beam Gatling gun. Though fully automatic the beam Gatling gun's individual shots are not as powerful as a beam rifle as they are seen to only chip away at the armor of an AMX-009 Dreissen mobile suit. The beam Gatling gun was destroyed by the funnels of the NZ-666 Kshatriya. A four-petal shaped shield that houses an I-field barrier generator; the feature is operational in both Unicorn mode and Destroy mode. Standard-issue equipment to all Earth Federation Mobile Suits. However, its length varies between Unicorn Gundam's two modes. Fed with 6-round magazines. The rounds operate differently than a normal bazooka, as they explode before making contact and release small beams on par with vulcans. When the Unicorn aquires a new weapon, such as the Beam Gatling Gun, the weapon needs to be converted before the Unicorn can actually use it in battle. This gives Unicorn an advantage by allowing it to use any weapon it can obtain, on the battlefield, without the need to return to the mothership for configuring. Alas, the 100th issue is finally here! In honor of this incredible milestone, today will be all about the Grabble: one of Zoey Sparklebird's favorite items! Like most people remember, the Grabble dates back to 2010, all the way to the Birthday Bash. It was one of 4 items to be introduced during the celebration (The others were the TOM 3.0 helmet, Jersey Devil Wings, and the Pancake Hat). It could be obtained from Chowder P.R.E.S.E.N.Ts but it wasn't until October 2011's Fusionfall Adventure that it was available to get through normal means. It can currently be bought from the Wisdom Tooth in Chowder's Mouth. I hope you guys enjoyed this week's item spotlight and I hope you enjoy the 100th issue even more! Description: The Toxic Heater fires a stream of toxic ions, poisoning monsters everywhere! How to get it: To get this weapon, you will have to grind for it from the Squish Scaler fusions located at Bravo Beach. Description: The body of this fish-like creature is soft and mushy, but that actually helps it absorb your attacks. 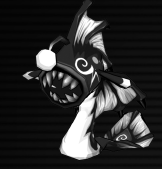 Don't get hypnotized by the lure on its head, or you'll be squished for sure. It usually keeps its mouth open, since its eyes are inside its mouth. The area is level 36. Well that’s all folks, until next issue, keep exploring! 1. What is your most memorable moment with the game? Entering the Past Zone for the first time in my entire life was definitely the most memorable... I was breathtaken by how amazing the world looked and how perfect the roles of my favorite shows all mixed together into one epic game. Seth Podowitz's awesome music made it even more flawless. 2. What were you looking forward to when you first started to play? Honestly, I had no idea what I was getting into. Prior to my registration on Cartoon Network, my parents were very strict with what I could and couldn't do online, so this had been my first MMO. It didn't take long to start making friends and save the world alongside them. 3. What was the toughest lair for you? 4. Which Fusion were you looking forward to fighting at first? Fusion Dexter, most definitely. When I figured out that I couldn't go and find him at first without a paid subscription, I got extremely upset. He looked so cool! 5. What is your favorite item? Since I got my hands on a Don Doom-issued scouter lens a long time ago, I barely ever took it off. 6. Was there a nano that made you feel as if you had completed a goal? Every time I leveled up and got a Nano, I felt a sense of accomplishment. It was always a cool feeling for me to have when I got one step closer to encountering Lord Fuse. I just got to beat up a big and bad, yet cool-looking Fusion, and at the same time I get my own miniature Cartoon character to be my partner in the defenses against the slimy green things. 7. Before you came up with your character's name, did you have other ideas? Oh, I had plenty. Trust me. They were pretty lame... Haha! 8. What was the one thing you wanted the most to be changed or added to the game? The expansion counts as one thing, right? No? Aww, okay... I one thing I wish for is if Cartoon Network would have kept the game in development and under moderation. The game was so much better with a controlled, yet lively and friendly community, and the game itself had a lot of potential. 9. Is there anything you wish you would have done more often when you were playing? Nope. 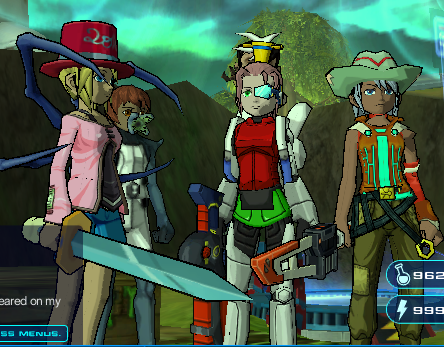 I made sure that I got the best possible experience while playing FusionFall, whether it was by myself or with the friends I've made. It's been an amazing four years, and the news about the game shutting down hit me very, very hard... I will never forget FusionFall or its epic community. I'd like to thank you all for the support you've given me while operating FMHQ and hosting events in the game. Zoey, thank you very much for allowing me to be interviewed for the final Gazette issue. On a final note, I'd like to wish every FusionFall player out there well post-shutdown. It's been great working and playing along with all of you. t was just a game, right? None of this was real. These tears........these A.I.s weren't real, were they? They weren't experiencing death....right? The world around me was breaking down as I stood amongst the A.I.s at the Sunken Mall. I observed how the beloved characters cried and looked on the impending doom, accepting their fate. Was this part of their coding? Of course it is, half my brain shouted as I watched Bubbles hug Mojo tightly. Don't be stupid, it's just a game! The developers are letting you experience the end of the game! But, the other half countered sadly. This isn't just a game. It's their life. "Is this really the end Double-D?" I paid attention to the three Ed's conversation. The three were huddled close to one another, seeking out protection from each other. Double-D looked the most composed. Eddy looked numbed. Ed looked sad. It was quite strange to see such reactions on their faces, considering how out of character it looked. Maybe they were glitching, or perhaps it was coded that way for this part of the game? Or maybe they're experiencing impending death, my brain said, to which I waved off. "Yes, Ed," Double-D answered with a resigned sigh. He began to pat Ed's head, the only way to keep the taller boy calm in such a dire situation. "I'm afraid it is." "After so long," Eddy whispered. "But why Double-D?" Ed asked. "This isn't fair!" a voice cried angrily. I turned my attention to Ben Tennyson. Amongst the other A.I.s he stood as the angriest. He wasn't sad like the others; he looked down right upset. "How can they turn their backs on us after our dedication to them! Haven't we given them everything!?" Ben continued. "You know there's nothing we can do," Max responded, trying to calm his nephew down. "We served our purpose." "That's not right!" Ben argued. "We know Ben," Gwen responded sadly. "But there's nothing we can do." "But what about the Users?!" Rex argued, standing up for his friend. He seemed angry as well. "Can't they help?" "No," Six responded stoically. "There's nothing they can do. They're in this with us as well." "It's still not right," Lance snapped as he stood protectively over Octus and Ilana. "I wish we could have had more time," Numbuh Three spoke up sadly from where she sat on the ground. "I hadn't even resurrected my master," Demongo said mournfully. "I never got a date," Johnny mourned from where he sat by Coop, who said, "I never got to salvage Megas." "I didn't get to jam with my band," Ace responded numbly, from where he stood with an arm wrapped around a stoic Buttercup's shoulders. "There is much we had left to accomplish," Jack said sagely. "But we weren't given the chance," DeeDee mourned as she held Mandark and Dexter in a hug. "The odds were against us," Computress commented. Courage whimpered sadly, burying his face in Juniper's shoulders. "We were new too," Finn, beside the Adventure Time characters, Chowder, and Flapjack, spoke up. "We had so much to offer," Johnny Test said as he was petting Dukey. "When the Future left, it was a sign," Grim commented sadly. A building crashed somewhere close, but my main focus was on the characters who were mourning the future they could have had. At the life, my mind said. At the life. "Will we ever come back?" Eduardo asked, whimpering and crying. Frankie was beside him, rubbing circles on his back to calm him down while Mr. Herriman looked over the residence of the House sadly. Even Cheese was silent, holding onto Mac just as Bloo was. "No," Drew said weakly as she sat with Zak's head in her lap. She was stroking her fingers through his hair. "No, we're not coming back." "There's only one thing we can do," T.O.M. spoke out, clear and calm. "And what's that?" Double-D asked. I along with the character fell after his words, and I heard myself scream with the other characters as we fell into the bottomless pit. As we fell, I saw Double-D, who had been separated from his best friends, reaching out to me. Compelled by his look of fear, I reached out for him as we fell. My eyes flew open, and I threw my helmet off of me. My heart was pounding, as I reached for something solid. "GAME OVER" was flashing on the visor lens. Taking deep breaths, I looked over to the computer screen it was linked up to, and saw that the entire page was gone. That was it. Game over. No more FusionFall. "Dead," I muttered out loud as another tear escaped. "Dead. Dead." More tears fell as I began to sob. "They're dead! They're dead! They're gone! They’re dead!!!" I fell to my knees and cried. Why....why were they dead? Why were their lives taken from them? It had always had a life, my mind responded back. You just didn't see it till now. Poll- Which areas hold the memories for you? As a special tribute to FusionFall, I have decided to post two songs for this category. Riddles: Last issue's riddle was answered correctly by Caesar Zeroazure! This week’s riddle: I am round with mesh, but I do not hit balls. I fly in the sky. What am I? Q of the week: If FusionFall had been a person, what would you have said to it? Thank you for reading this issue of the Darklands Gazette!! Re: The 101st issue of the Darklands Gazette!!!! Nice issue.  But who's that girl with the wings and white hair? Thanks Silver. And that's The Fallen. Here's to us being able to stick together for so long. I just got around to reading the issue...I'm sorry I forgot about it. I loved the way you brought older articles back Zoey, to really highlight some of the great moments the Gazette has had.